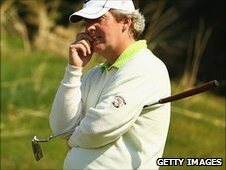 Windermere golfer Simon Edwards is struggling with his fitness ahead of the Pro-Am Championship in Bahamas but has vowed he will compete. The 39-year-old Welsh National winner is suffering from an ongoing shoulder injury ahead of the 36-hole tournament which begins on 27 November. Edwards is set to team up with amateur John Baines after the pair qualified for the event in May. "I'm on a tight timescale to make sure I'm fit to play," said Edwards. He added: "I've had a busy year with tournaments and at the club, so I suppose with the amount of balls you hit, it's going to take its toll eventually. "I injured the tendons in my shoulder and haven't been able to hit a ball for a month but I've been seeing a specialist, and getting treatment to try and get myself ready for the Bahamas." Edwards and Baines will join 15 teams from the UK and Ireland at the Emerald Reef Golf Club for the two-day event. "I'm prepared to have a cortisone injection so that I can play in the final and then get it sorted out properly when I get back," Edwards continued. "But I honestly believe that we can win this final if I'm fit, without a shadow of a doubt - and whatever happens I will be there."